A height Increase Shoe Lift, that reduces the pressure on both the knees and back. An extremely comfortable design that molds to the shape of the foot. A shoe lift that combines a flexible high fiber insoles surface with total control of adjustment and a ventilation network that helps control foot odor and also helps the foot to breathe. A shoe lift that incorporates a unique air cushioned heel support system. 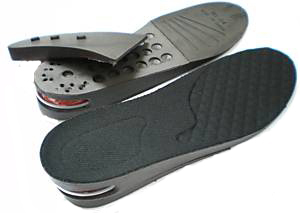 Shoe lift incorporating an adjustable layer system, giving the user, far more flexibility than any single piece shoe lift available, allowing adjustment of the Height Increase obtained. Adding a layer shim, to the shoe lifts allows an increase of five centimetres to your height, appearing to make you grow taller gradually rather than a noticeable, instant height increase. * Increase your height by 3.5 – 5cms with a multi-layered shoe lift. * Durable and strong shoe lift, can last a lifetime. * A height Increase shoe lift that can help you to become taller, reduce leg length discrepancy issues, aid in the treatment of spinal problems and greatly increase self confidence.